Domestic Discomfort is an exhibit of large-scale images based on my childhood family album. Combining small scale images within large scale mural prints made in the darkroom, the work addresses family trauma within the concept of intimacy and distance. 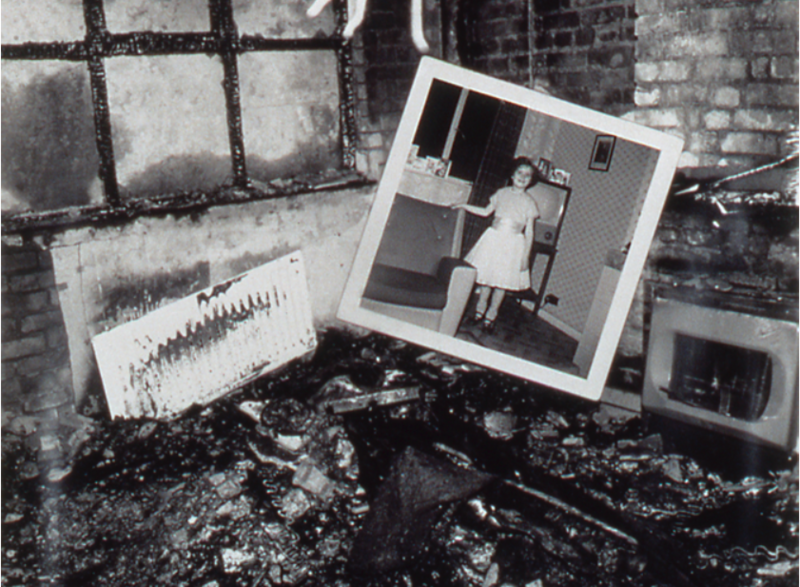 In 1988, my parents and my niece Sarah died in a fire in the family home in Belfast, N.Ireland. One of the few items that survived intact was my father’s sea trunk. This work was created in part ­from family snapshots discovered in the trunk, from an old album my aunt had given to me years before, and from images I made within 24 hours of arriving from Chicago to witness the burnt -out house. It would be eight years later before I could bear to process the film I had shot of the house and make this work of remembrance. Other artifacts from the sea trunk would later form the basis of the work, Sundays At Sea.